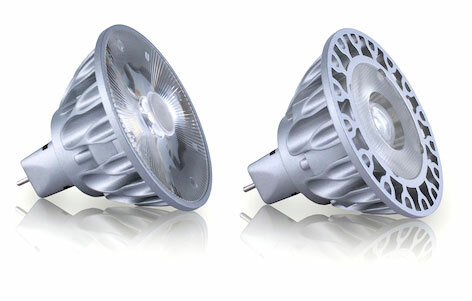 GaN-on-GaN LED technology enables the tiniest, brightest LEDs, which in turn enable a VIVID 2 lamp with a single light source. Combined with a single optic, this tiny light source delivers a beam that has minimal light spill and renders crisp shadows. The MR16 lamp is winner of the red dot design award and organized around a single very small, very bright LED light source combined with a single optic and heatsink. The organic fin geometry heatsink has a tiny core and more fins at the edge, maximizing heat transfer out of the lamp. The "Origami" electronic circuit, designed with components used in automotive and other extreme temperature environments, can tolerate and dissipate significantly more heat than other LED lamps. The Snap System is the first LED lamp/accessory solution that is optimized to work as an integrated system. Based on high brightness single source GaN on GaN™ LED technology combined with an innovative set of magnetic filters and lens attachments for lamps with 10 degree beam angle, it completely redefines accessory application.